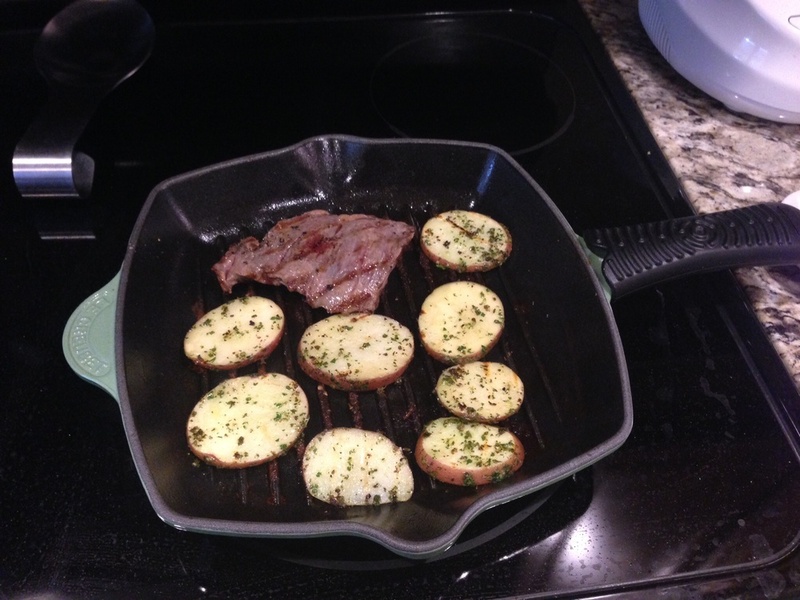 Before I got the plague, we tried this recipe for Skirt Steak and Potatoes with Herb Sauce. It was a great recipe with my modifications and with more modifications, it would be fabulous. I had a hard time finding a skirt steak at Target so I ended up at HEB, where I found one that looked a little bit better. I also opted to substitute red potatoes for sweet potatoes, as we don't really care for sweet potatoes. I started off by slicing the potatoes and I got a little over zealous and may have cut more than I really needed. Two to three potatoes would have been fine and I probably cut four to five. Then, I made the herb sauce, always a great excuse to bust out the food processor. Finally, we got the grill pan ready for the steak. We use a grill pan on our stove top instead of an outdoor grill due to the fact that we don't want to be responsible for catching this dry state on fire! Everything always turns out great, but it would be nice to have a little more space. We ended up making several batches of steak and potatoes to get everything cooked. Everything was great, but the skirt steak was a much fattier piece of meat than we realized. In the future, we would definitely opt for a less fatty piece of meat and possibly consider picking up a second or bigger grill pan!